"Create an encrypted provider, but use two keys: one for your girlfriend and one for you (so there will be no tragedy if she forgets her passphrase):"
The problem I see is that this kind of statements (transmitting implicitly that System Manager is a male and his girlfriend is stupid) can give really negative image of FreeBSD community, also it is possible that female users feel offended and withdraw from using this OS. As a female user of free software, I have to say that being treated without prejudices is rare in IT communities, integration is difficult and surely this kind of behavior does not help. While the outcome was positive in that the wording was changed to a reference to "the company's security officer", other FreeBSD contributors replied to Lena's bug report by using several derailing tactics. First, Garrett Wollman replied by accusing Lena of heteronormativity for assuming that the man page author was not thinking of a gay female sysadmin who had a girlfriend. Second, Randi Harper replied -- even after the bug had already been fixed -- accusing Lena of "wanting special treatment" as a woman for complaining about sexism. Harper's response was followed by an approving comment from a US Army Sergeant Maxwell Conrad accusing Lena of engaging in "politically correct babble". Conrad's response brought antagonism into what was originally a polite request. 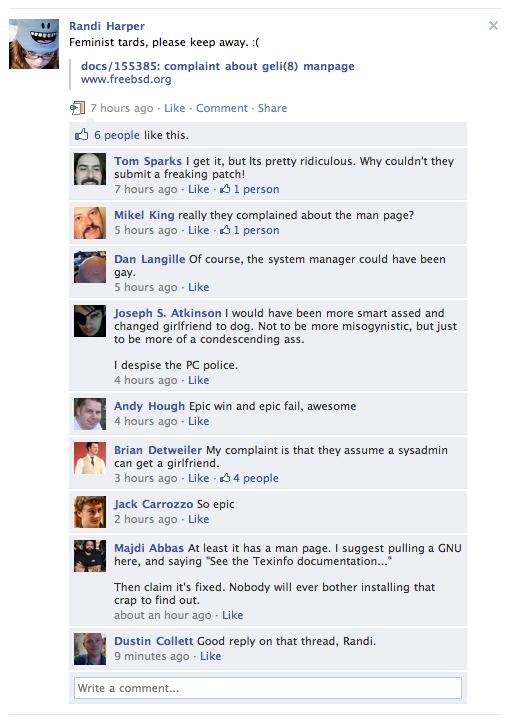 Harper's Facebook page also referred to her desire not to see "feminist tards" in the open-source community, with approving replies from many people with ordinarily-male names . None of the derailing replies addressed Lena's very valid point that unnecessary, sexist comments in documentation harm the image of the FreeBSD community. When women silence and shame each other for calling out sexism in open source and receive approval for doing this silencing from male colleagues, the environment continues to be a difficult one for women to challenge sexism in -- underlying the importance of male allies in calling out other men's sexism. When women are attacked by both other women and by men for calling out sexism, that creates a hostile environment that discourages any attempts to improve the climate and to improve the community by welcoming contributors who aren't straight, cis men. And when women in open-source feel that the only way to get approval from men is to attack any woman who challenges sexist behavior, that creates an additional barrier to participation by any women who do not accept the misogynist party line. The incident also illustrates a double bind when it comes to reporting sexism: if the reporter identifies herself as a woman, as Lena did, she can be accused of "asking to be treated differently." By default, someone presumed to be male would have been assumed to be looking out for the needs of the community in filing an identical bug report, whereas someone who identified herself as female was, merely because of her gender, considered to be looking after only her own needs. On the other hand, the reporter does what Harper suggested (in a comment that itself began with "As a female committer") and "leaves her gender out of it", she can be silenced with the Not a woman tactic.